We all know that a lovely Croissant or a Pain au Chocolat go well with a good coffee, but sometimes it is also important to know where to get a good “cuppa” – meaning good tea. Obviously we are not just talking about your usual black tea here. Isn’t it great to go into a cute little tea room and chose a great chai blend with chocolate aroma or to learn about different types of green teas? In a tea room you might not find many croissants, but where there is tea there definitely is cake! And if you’re lucky you will find a scone or two…. Sandy from S Marks the Spots loves her tea rooms. She calls Comptoir Florian a little gem for tea lovers. 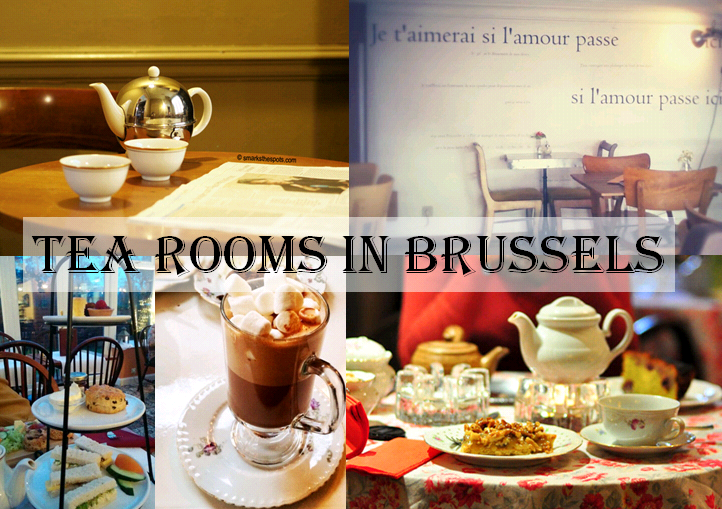 Little Brussels Sunshines roots for AM Sweet. She thinks this is a tea room with a soul. As a Brit Michelle from Very Hungry Explorer enjoys the tea room at Stone Manor. Why not treat yourself to afternoon tea? The foodalist likes the baroque atmosphere at La Mercerie. She could die for hot chocolate in this girly tea room. Emanuelle and Vanessa from La Dinette des Grandes call “Tea for Two” an institution. Plus, they had fun choosing from a long list of teas. Tastes of Brussels is written by Emily & Philipp, an Anglo-Austrian couple currently living in Brussels. They love authentic and good food and hate tacky restaurants and rip-offs. As good food needs to be washed down with Belgian beer they know all about great watering holes and Trappist beer, too. (Look out for the beer reviews on Thirsty Thursday!) Recently they have been walking off the calories – and have discovered some great sights and parks in Brussels.